Mitt Romney threw the ultimate insult on Donald Trump: He's a "phony" who will sink the U.S. economy. "His domestic policies would lead to recession. His foreign policies would make America and the world less safe. 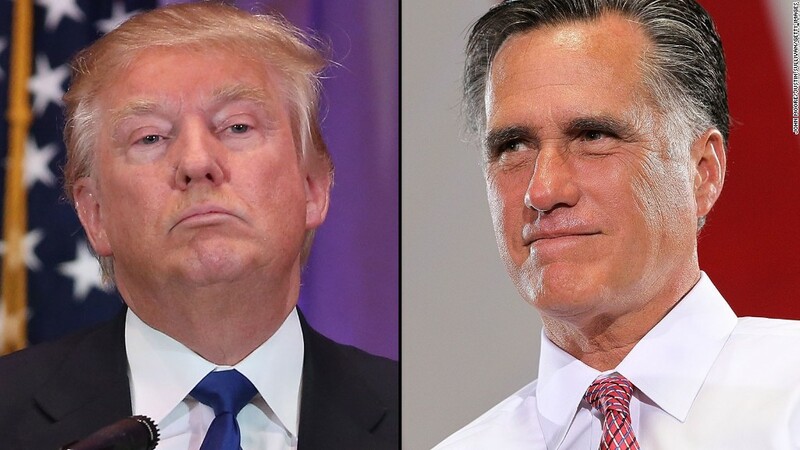 He has neither the temperament nor the judgment to be president," Romney said in a highly critical speech of Trump on Thursday. Romney is the latest in a deluge of high profile American leaders warning that Trump doesn't have a clue how to lead the economy, let alone the country. Trump "has a kindergarten view of economics," billionaire investor Stan Druckenmiller said Wednesday on CNBC. "The stuff that comes out his mouth just astonishes me." Hewlett Packard Enterprise CEO Meg Whitman called Trump "unfit" to be president. Whitman, a Republican who lost in her bid to become governor of California in 2010, is reportedly part of a group of business leaders raising money to block Trump. Trump and his team have fired back claiming this is just another example of the out-of-touch GOP establishment. Beyond the insults, could Trump's plans for the country send the U.S. into a recession? The biggest fear in business circles is that Trump would start a trade war with China (among other countries). He threatens to slap tariffs -- aka fees -- of up to 45% on Chinese and Mexican products. Those countries aren't going to send a thank you card back. They're likely to respond by hiking fees on U.S. products coming into their countries. "One of [Trump's] themes is we're going to give it to China, et al. If we get into a trade war, that's not good for the markets or the economy," says Bob Doll, chief stock strategist at Nuveen Asset Management. Foreign trade supports about 13% of the U.S. economy. A mega trade war would hurt growth. Another concern about Trump is that he's unpredictable. He speaks off the cuff, and he's changed some positions during his campaign (that's without counting the times he's switched political parties and policies during this lifetime). Business leaders and investors hate uncertainty. They want to know who and what they're dealing with. Trump is the ultimate wild card, which could make businesses -- and the American people -- scared to invest and spend. "The simple answer is the market is going to get worried or have its uncertainty concerns anytime there is a non-establishment candidate," says Jason Pride, director of investment strategy at Glenmede. More people working powers an economy. Trump's plan to deport over 11 million undocumented immigrants would shrink the U.S. population by about 3%. That could be a big hit to the economy. Almost overnight, the U.S. would have fewer people working. That said, policy experts see this proposal as unlikely to come to pass. If Trump did put tariffs on Chinese and Mexican goods, it would make them more expensive. Basic household goods at even big box retail stores like Walmart (WMT) or Target (TGT) would possibly cost a lot more if Trump did the 25% or more fee he has tossed out while campaigning. It would be an immediate hit to lower and middle class family budgets. Even worse, it could cause people to spend less because they're worried about items getting even more expensive in the future. People buying things drives about 70% of the U.S. economy. Any slowdown in spending would translate to lower growth and yes, possibly recession. Trump's tax plan would cut taxes for most Americans and businesses. While his tax plan alone could help create jobs, there's a big tradeoff: Trump would cause government debt to skyrocket. An in-depth analysis by the Tax Policy Center finds that his plan would add $9.5 trillion to the debt over the first decade. The Tax Policy Center calls it "likely unsustainable." In the short-run, his tax plan could boost growth, but over time, the growing debt would choke growth. Still, many on Wall Street are skeptical that Trump would enact policies that actually hurt business. They expect he would become more moderate if elected. "What does he care most about? His image. He wants to be a guy known as a great businessman. He's going to be pro-business," says Kevin Kelly, chief investment officer at Recon Capital Partners. But Romney ended his speech with a warning: "If Donald Trump's plans were ever implemented, the country would sink into a prolonged recession."